Nothing says "autumn" like apple pie and by making individual pies, you can take this quintessential fall dessert anywhere. Little apple pies are just the thing to tuck into a lunchbox or picnic basket, and they're perfection when served warm with ice cream after dinner. Because these small pastries don't spend as much time in the oven as a big pie does, the apples are precooked so they'll be tender by the time the crust is nicely browned. Precooking, along with a little cornstarch, also tames the apples' juiciness, keeping the pastries neat and manageable. The crust for these little apple pies is a basic butter pie crust, but you could use sheets of prepared puff pastry if you like. If you have an apple peeler/corer/slicer, this handy gadget makes quick work of cutting the apples into small pieces: simply set each peeled and sliced apple on a cutting board without separating the slices. With a large knife, make two cuts (to divide the apple into thirds), then turn the apple 90 degrees and make two more cuts. 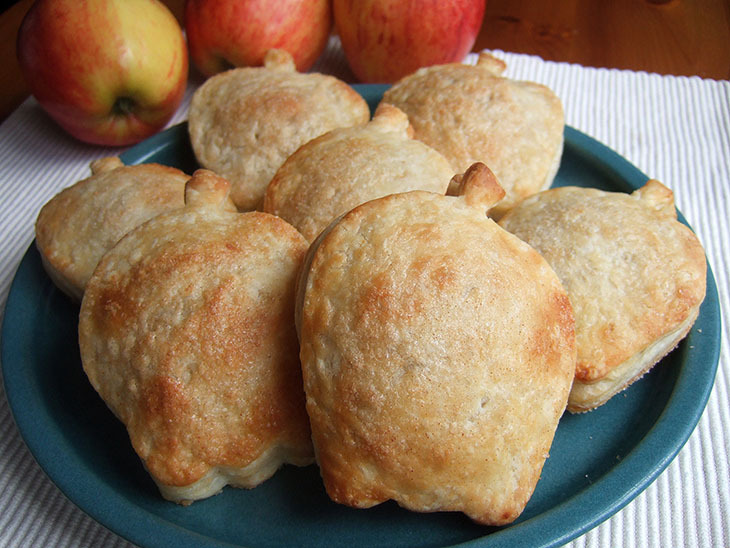 My favorite shapes for Individual Apple Pies include the Apple cookie cutter, the Turtle cookie cutter, and the Mitten cookie cutter.